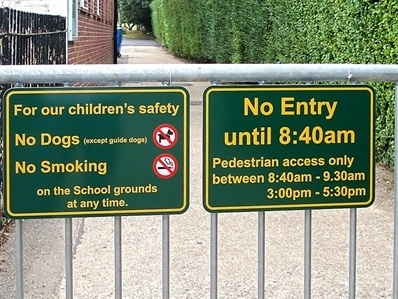 At Elementary Signs we offer a clear and concise way to guide and inform visitors and parents around the school. These signs include standard signs and messages such as Disclaimer signs for car parks and bike & scooter parks, directional signs to the school office, emergency access signs, etc, the list is endless. We have a large range of signs in this category but if you don't see the sign that you want them ask us to design it for you, we don't charge for this. These signs are built to look good and to last and are available in standard colours or to match your school colour.